In our quest to stay true to our goals, we have added Native Ads to our array of advertising options which is known to have higher earning potential and CTR compared to other ad types. In this post, I will show how you can setup and start publishing Native Ads on your blog but first, let's do a quick overview on Native Advertising. "Native advertising is a type of advertising, mostly online, that matches the form and function of the platform upon which it appears." "Material in an online publication which resembles the publication's editorial content but is paid for by an advertiser and intended to promote the advertiser's product." In addition, Oxford says ‘native advertising is blurring the lines between advertising and content’ and this is one major reason why it works so well. In other words, with Native Advertising, it is difficult to differentiate between an actual editorial article written by the host publisher and paid advertising content published through Native Ads. Publishers who deploy Native Ads usually see higher click through rates compared to other advertising types like banner, popup ads etc. According to a research done by Polar in 2016, the average mobile native ads CTR is 137% higher than desktop CTR. Native Advertising is one of the major ways Digital Marketers buy mindshare and drive traffic to their brands. 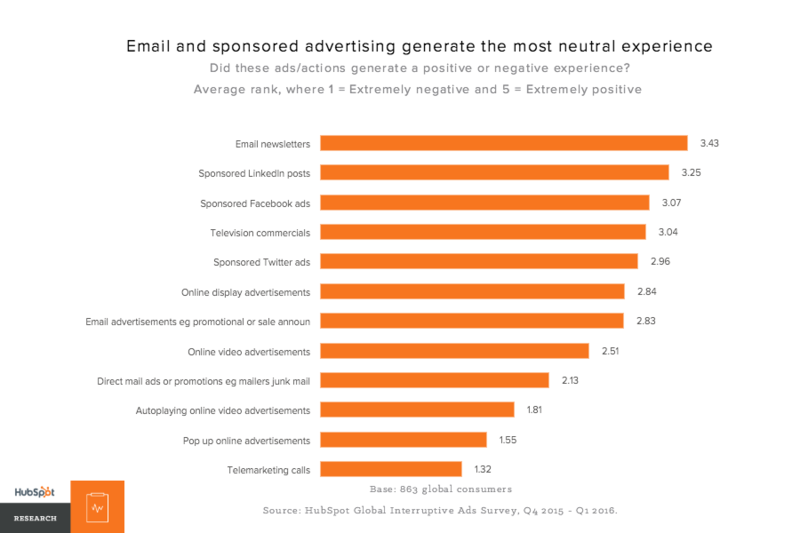 Finally, just before I wrap up this overview, here's the research carried out by Hubspot in 2016 on users' experience from different advertising channels ranging from Email newsletters to Telemarketing calls. Figure 1 above shows the best rated types of ads; these are ad types that don't disrupt the user's browsing experience. You can see that apart from Email Newsletters that has taken the top spot, Sponsored content on LinkedIn, Facebook and Twitter (which is a broader category of native advertising) follows in rank for the best rated ad types. I will just have to end this overview here before it gets too long...and I hope I've been able to shed some light on the prospects of Native Advertising so far? ...now let's talk about how you can get started publishing native ads on your site. I will want to assume you have already registered your account on NG Adverts as a Publisher and have had your site approved. If you haven't yet, Sign Up to get started. Moving forward, here's what to do next. After that, fill in other fields/select the options as you desire as shown in the screenshot below. Header Text: You can change the text to what you want to display. Targeting Site: Select the site you want to publish the Native Ads on; only approved sites will display in the list. Select Ad Layout: Choose the layout you want depending on the size of the space where the native ads will be published. Make Ad Responsive: Select this option to make ads fit well into your site anytime visitors view it either via desktop or on mobile. After clicking on the Create Ad Code button, your unique code will be generated which you can now paste on your blog's html area where you want the native ads to display. Will ultimately make you more advertising money. As a recommendation, I advice that you use a mix of other ad types plus native ads and see what works best for your site. ...and if you are wondering if the articles in the box just below this article are native ads, you are definitely not wrong. So get started and increase your site earnings through native ads. Feel free to return to this post and share your experience publishing native adverts in comparison to other types of ads.